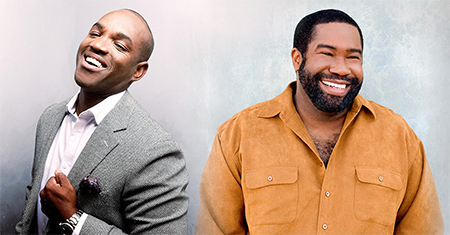 Tenor Lawrence Brownlee will join bass-baritone Eric Owens in a wide-ranging duo recital with pianist Craig Terry on the Tuesday Musical series at Akron’s E.J. Thomas Hall on February 12 at 7:30 pm. The program includes opera arias and duets, traditional Spirituals, American popular songs, and Gospel favorites. Born in Youngstown, Brownlee has established a distinguished international career as a bel canto tenor. We caught up with him on the road in Dallas, where he was returning from an appearance in Bizet’s Pearl Fishers with Houston Grand Opera. Daniel Hathaway: We were sorry to miss hearing you in January when you were in Cleveland to sing a Rossini aria for the Martin Luther King Jr. Celebration with The Cleveland Orchestra. Lawrence Brownlee: I told somebody I wasn’t sure if I was in Siberia or Cleveland, but it was good to be back in Northeast Ohio, my neck of the woods. My parents would have come, but the weather was a little bit too bad. I hope things will clear up next week so I can get a chance to see some of my people and they can support me. DH: You have a long tour ahead with Eric Owens and this duo recital. I count eleven performances between now and summer. LB: It’s pretty exhaustive. We’re going to travel many, many places. It starts off in Akron, we’ll be in California a few times, and we’ll perform in Detroit, Georgia, North Carolina, New Jersey, Philadelphia. We’ll be bouncing around a lot, and it will be fun to share the music that we love. I’m looking forward to bringing that concert to Northeast Ohio. We did it for the first time last season, and I have to say it was such an overwhelming, positive experience that my managers said we absolutely had to do this again. DH: How did the duo recital idea come together in the first place? LB: Eric and I are longtime friends. I’ve known him close to twenty years. We’ve shared the stage in many operas, and we have the same management, which makes it easy to coordinate dates. And so it worked out with our opera schedules that we could come together and perform this program. Both of us like giving recitals — it gets us up close and personal with the people — and I always feel that we get a chance to share in a different way than on the opera stage. LB: You want to put the most difficult things at the beginning, so after that you can just coast and relax. I like singing that piece. It’s a crowd-pleaser, and I do it for the people. They like to hear that aria, so it’s one that I sing often. DH: You’ll also be singing an aria and duet from Pearl Fishers. 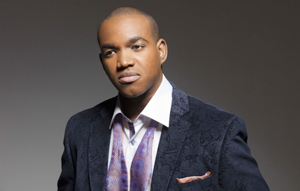 Was Eric Owens with you in your recent production in Houston? LB: It was a fine cast, but Eric wasn’t part of it. It was also a very young cast. It’s funny — I was the oldest person including the stage director and the conductor. DH: Tell me about the Spirituals and the popular songs which are next on the program. LB: Some of the Spirituals are classical ones that people will know. Two of them were arranged by my good friend Damien Sneed, and Craig Terry arranged a lot of the American songs. He’s like an encyclopedia and he’s introduced us all to new music. Song of Songs, Lulu’s Back in Town, Dolores, Lollipops and Roses, and Through the Years may not be so well known, but they’re great gems and wonderful pieces of music. Some of them are from little-known shows. We both stay on stage for the second half and we play off the energy of each other. More than anything, it’s just real fun for us to share, and a lot of people have commented that they see and feel a lot of camaraderie. We have a genuine friendship, and I think that’s one of the things that makes this concert feel warm and inviting. DH: You’re going to be singing in a number of different styles. How does it feel to shift gears so much in a single program? LB: The reason why we can do this concert is that we’ve both been versed in various styles. I grew up singing Gospel — that was the beginning of my musical education. From there I did musical theater, madrigals, show choir, some pop, contemporary Christian, and then American popular song in some of the musicals I’ve taken part in — and I used to do dance. So my background is varied, and that’s the truth! Eric and I have a pretty vast knowledge of different styles so it’s very easy for us to shift between them. It’s a lot of fun. DH: What would you say to people to attract them to your recital? LB: Some people may not be opera fans, but they like Spirituals. We want to provide a varied program and to show the camaraderie between us. We hope there’s an energy that goes beyond the footlights and that people will feel a friendly atmosphere for the enjoyment of music. I hope people will come out to experience it. DH: Here’s a final, non-musical question: I’m not a football fan, but I know you are. What did you think of the Super Bowl? LB: Oh, gosh. We’ll, I’m not a fan of the New England Patriots, so I barely watched it. As a rabid and die-hard Steelers fan, it used to be nice to be able to say that we were the only ones that had six Super Bowl trophies. Now we have to share that with the Patriots — but I hope we can win another so we can have that exclusivity again. I’m looking forward to that.